Last weekend I attended the International Food Blogger Conference, conveniently located in our hometown, Santa Monica, CA. Immediately after the conference, a slew of folks came over to our house for a potluck lunch. I wanted it to be an informal, fun gathering — not filled with the “shop-talk” of the conference, but just friends hanging out. All the cooks were food bloggers — and we’ve got some very creative foodies in our crew — so you can imagine the selection was quite wonderful and inventive. (I’m going to link to the recipes below, and will update the list as more recipes come in). Since I knew most folks would already be cognizant and considerate of various dietary restrictions, I didn’t have to do all that much potluck prep. 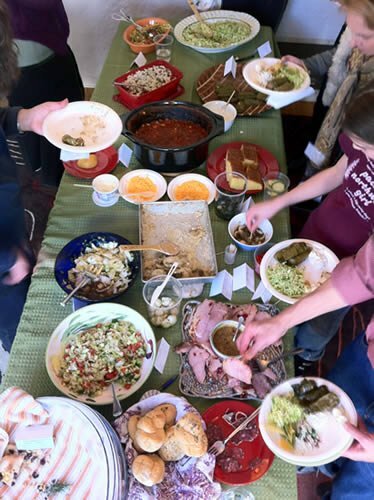 A few simple steps can make for a more enjoyable experience for everyone — so here are my top five tips for how to host an allergy-friendly potluck. If you don’t already know your guests’ dietary restrictions and preferences, just ask. You’ll be a gracious, considerate host, and your guests — those with allergies and those without — will appreciate your concern and attention to detail. 2. Spread the word, and be specific. Don’t be afraid to set an allergy-friendly “theme” for the party. You could simply inform guests that the entire party will be dairy-free, for example. If they balk, you can encourage them to have a little fun with the extra challenge. Be sure to give them plenty of lead time (especially if they’re not accomplished chefs), and have a few solid recipe suggestions at the ready, just in case they ask. Cross-contamination can be a serious concern. It may be wise to use two tables and separate the food accordingly. It can get a little frenzied as everyone swarms the buffet table, so that’s an easy way to avoid cross-contamination. Also, provide just one dedicated serving utensil for each dish. This way people will be more likely to put that spoon right back in the dish rather than use it to scoop from the one next to it, too. Using appropriate utensils also helps keep people from using their own forks (or fingers!) to grab food, since the serving tools will work better anyway. Many folks appreciated the thoughtfulness of this. I just printed up some small table tent cards so each person could write the name of the dish, their name, and then check off a variety of special-diet-friendly items. I included Vegetarian, Vegan, Dairy-Free, Gluten-Free, Soy-Free, and Nut-Free. It actually sparked several conversations, too — including some suggestions of adding Organic, GMO-Free, or Low-Sodium. Obviously you don’t want to go overboard with this — some people found the checkboxes intimidating and had to ask for help in decoding them. But that was part of the beauty of it: It increased awareness with the spirit of community, without being elitist, passing judgement, or otherwise creating conflict. Here are some of the dishes shared by my fellow food bloggers. 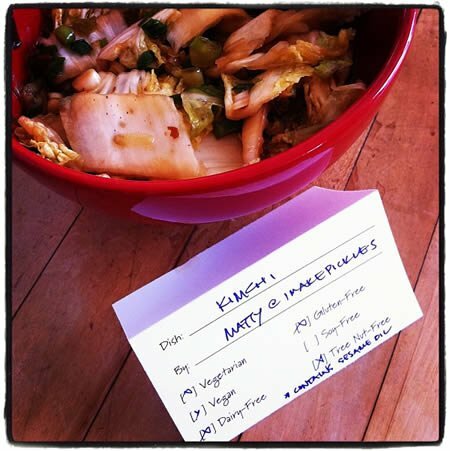 (They might not all follow my three rules, but I think a potluck is worthy of a cheat meal!) I’ll continue to update this list as folks post their recipes on their own blogs. Thanks to Melissa’s Produce for donating the fun Buddha’s Hand and Asian Pear party favors and to SIPtheGoodLife Sustainable Wines, Tolosa Vinyard, and Carmel Road Winery for donating their delightful libations. Those simple tent cards made your potluck such a fun time. To be able to kick back, enjoy the company rather than worrying that we couldn’t eat anything since we didn’t know what was in each recipe. What a party – a perfect space with 2 perfect hosts…Still swooning over the truffled potatoes. Thanks, Liz! Erika definitely knows her stuff when it comes to truffles. Great idea, Andrew. So many of us miss the social part of sharing food and this would help make a lot of people feel safer. I will be sharing this post with my readers. Thanks! Fabulous tips from an even more fabulous host! Thanks for the recipe links and the template! Thanks Carol. Also, we’ve nearly finished off the rest of your energy bars. Definitely going to have to make more! xoxo! This is so well timed with the holidays approaching and such simple, sound guidance. We are gluten free in my family (by necessity) and that has provided a cause for a great deal of thought especially in the arena you are illustrating. I think unless you are unable to eat everything at a meal anywhere, you seldom take pause to think through others navigating a buffet more like a mine field than a meal out. Thinking through and providing the simple signage you mention make all the difference AND leaves it feeling like a meal for everyone, not just those witout allergies or restrictions.